In this article we'll try to answer the most frequently asked questions regarding biomass and how it works with your project. For even more information on the advantages and different types of biomass boiler then head over to our main Biomass Boiler page. Biomass is an academic term, which often confuses people. The term “biomass” is in fact shorthand for 'biological mass'. It is fuel material derived from any biological (plant or animal) source. Wood fuel, is just one type of biomass from a list of many. In terms of renewable heating, 'biomass' refers to solid forms of biomass such as wood, (log, chips and pellets), grain or miscanthus, the fuels which can be burned in our biomass boilers. 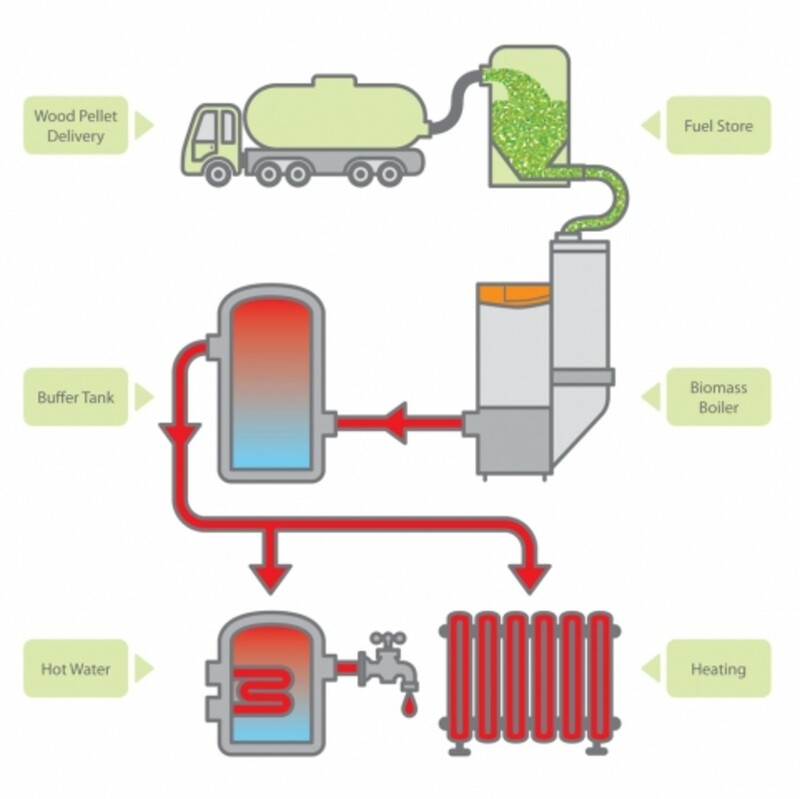 How different is a biomass boiler to a fossil fuel boiler? A biomass boiler simply replaces your existing fossil fuel boiler and is then connected into your existing heating system - whether it is radiators, underfloor or warm air heating. It can be significatly cheaper. For example savings of 80% agasint all oil can be acheived where an exsiting wood supply is contract chipped. It can generate significant annual payments for heat generated and used from schemes such as the Renewable Heat Incentive. Most modern commercial biomass boilers are automatically fed, just like an oil or LPG boiler, so you should notice no difference with regards to fuel handing. This means you should not be manually handling fuel! Wood pellets are automatically fed into a fuel store by delivery truck, usually blown or gravity fed. Wood chips are normally fed into a fuel store through an access hatch on the side of the fuel store, or tipped through a retractable roof. Alternatively, wood may be chipped directly into a fuel store, where they are kept dry and ready for use. Fuel stores can custom built, built in a converted building or supplied within a pre-fitted shipping container. The store should be built so that it is large enough so that only three or four fills per year are required. The fuel store should prevent ingress of moisture and be kept free from contaminants and foreign bodies such as stones, animal carcasses, metals, coatings or preservatives. Wood chips are stirred by an agitator, made up of a rotating disk with sprung arms. Fuel then drops into an auger, a giant corkscrew, which moves the fuel smoothly from the store to the boiler. 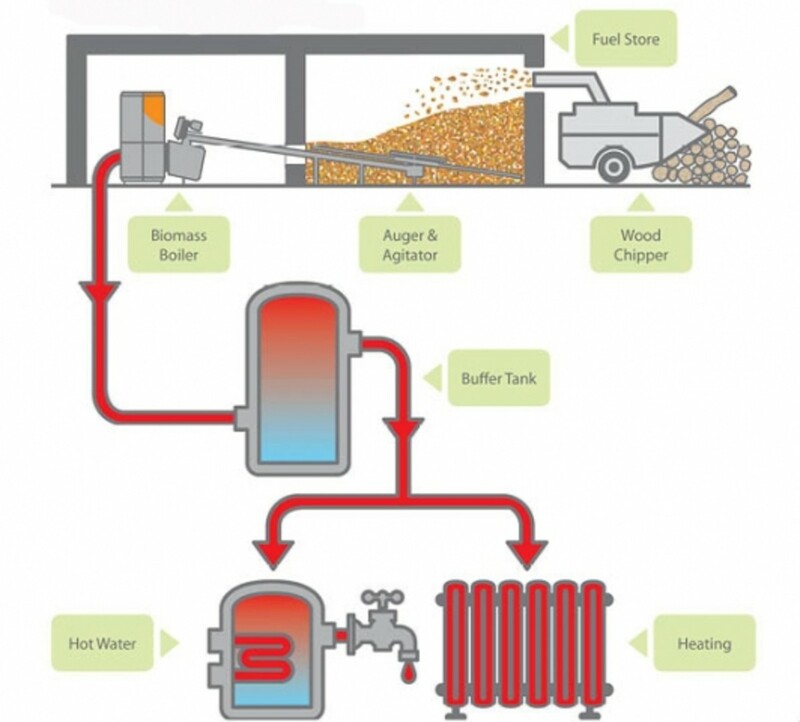 Wood pellets (pourable grain, chopped or pelleted Miscanthus) are free flowing and so the fuel stores are built at a slant and fed into the boiler. When using logs, the fuel needs to be manually fed into the boiler. A biomass boiler works in a slightly different way to an open fire or stove. The process is known as 'gasification'. This means that the fuel is burned at a temperature of 600˚C to release gases. The hot gases are then re burned (hence the name gasification), which generates temperatures of 1,200˚C. Buffer tanks, often also called thermal stores, store hot water that is distributed around the central heating system. This means that the biomass boiler’s job is to boost temperatures in the tank, rather than starting from cold each time heat is required, which makes for a far more efficient heating system. Most modern biomass boilers that we sell generate 0.5-1% of ash to the volume of fuel used. This means that the large ash bins need to only be emptied every 6-8 weeks. Wood fuel ash makes great fertiliser as it is high in nitrates. Using biomass to heat your property not only reduces your CO₂ emissions, helping the environment, it reduces your fuel costs and if accredited to the Governments RHI scheme, payments can be received based on the amount of heat used and produced. The RHI is a government scheme that pays the owners of biomass boilers for the heat they generate and use. The commercial Renewable Heat Incentive (RHI) was launched in November 2011. The second Phase of the scheme, targeted at domestic dwellings was launched in April 2014. Its purpose is to increase the deployment of renewable heat, including biomass boiler heating systems, and to enable the UK to reach its binding 2020 carbon reduction targets of 20%. The scheme works by giving the owners of biomass boiler heating systems a financial incentive to move to renewable sources of heating from fossil fuels. Commercial RHI payments are based on heat consumption in kWh and are calculated by submitting quarterly meter readings to Ofgem over a 20 year period. Domestic RHI payments are calculated based on the 'deemed' or estimate heat use defined in an Energy Performance Certificate (EPC) but over a period of seven years. For example, a large rural estate with seven separate buildings, chipping their own wood using a 100kW biomass boiler, could save up to 80% in fuel costs, when compared to fossil fuels and could gain approximately £11,000 every year for 20 years, index linked to inflation. A 40kW biomass boiler, serving a 6 bedroom house with an EPC rating of 52,560 kWh per annum would make £6,412 per annum, over 7 years and pay back in approximately three to four years on an installed cost of £23,000 (wood pellets) -£27,000 (logs). We hope the above is useful to you, but do get in touch if you would like to discuss any other aspect of your biomass boiler project or leave us your details and we'll get back to you!